A bridal card for love-themed needs! Welcome to another post for Amy K’s Inkin’ Krew Blog Hop for Tuesday, January 8! 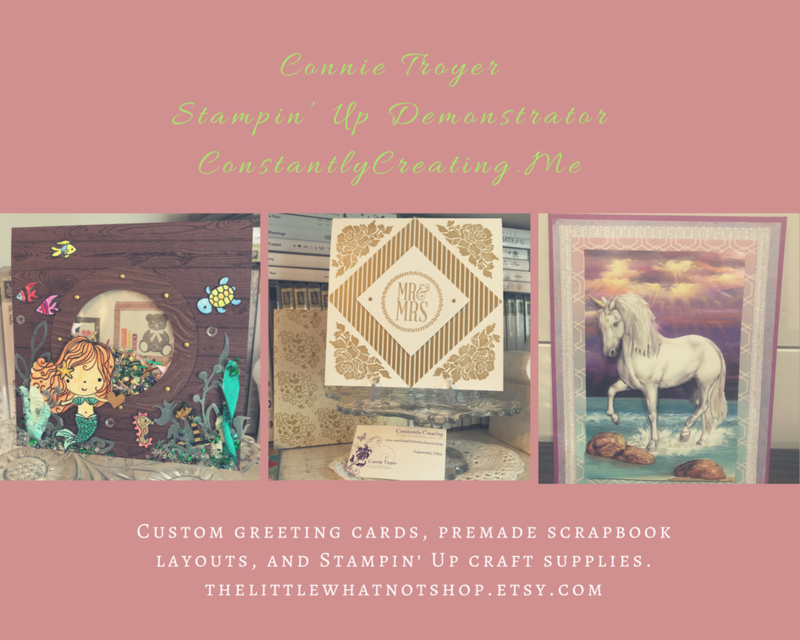 This month we are featuring the theme of love with Stampin’ Up products. I’m making wedding and anniversary cards for my local gift shop right now (along with other themes and random custom orders), so I was very excited to join this hop! For several days now, I thought I knew what I was going to create for this blog. In the end, I did stick to my original (barely fleshed-out) idea, but did I ever find ways to complicate it. (I always do.) I definitely should have started on it earlier. But I had craft room organization on my mind this week and I got to it when I got to it. I was able to use several current SU products as well as a couple of retired products and ones from other companies (oops!). The focal point of the card is the bride stamp from the “Wonderful Moments” stamp set, set off by a lace oval from the Delightfully Detailed Laser-Cut Specialty Paper pack and a background of Petal Promenade DSP. The laser-cut paper is vanilla on one side and white on the other. Since my card base was white and the bride’s dress would be too, I chose to use the vanilla side of the lace oval. And then I decided it needed something else. It felt too plain and too neutral. I kept “seeing” pink with this stamp and card, but the last two wedding cards I created had pink hues in them, so I tried to use other colors. 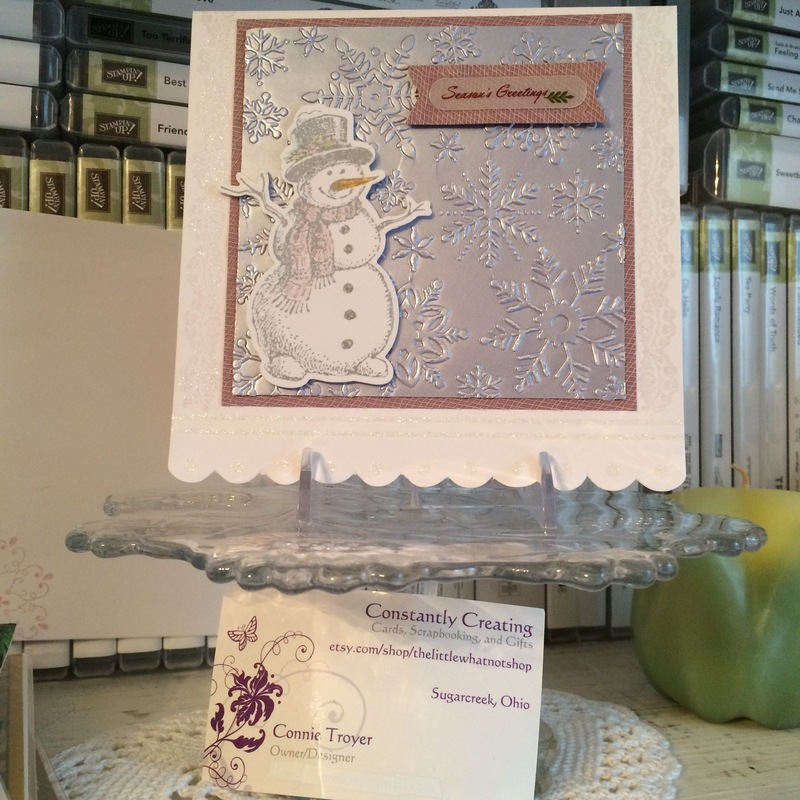 One of the retired products in my stash that I need to use more of is our Iridescent Ice Stampin’ Emboss Powder. I’ve only used it in small bits until now…but I remembered seeing others do a whole-scene kind of treatment with it. I wasn’t even entirely sure I remembered how this product worked since I bought it late in the game, but the paper was definitely ready to be treated – it was still inky. 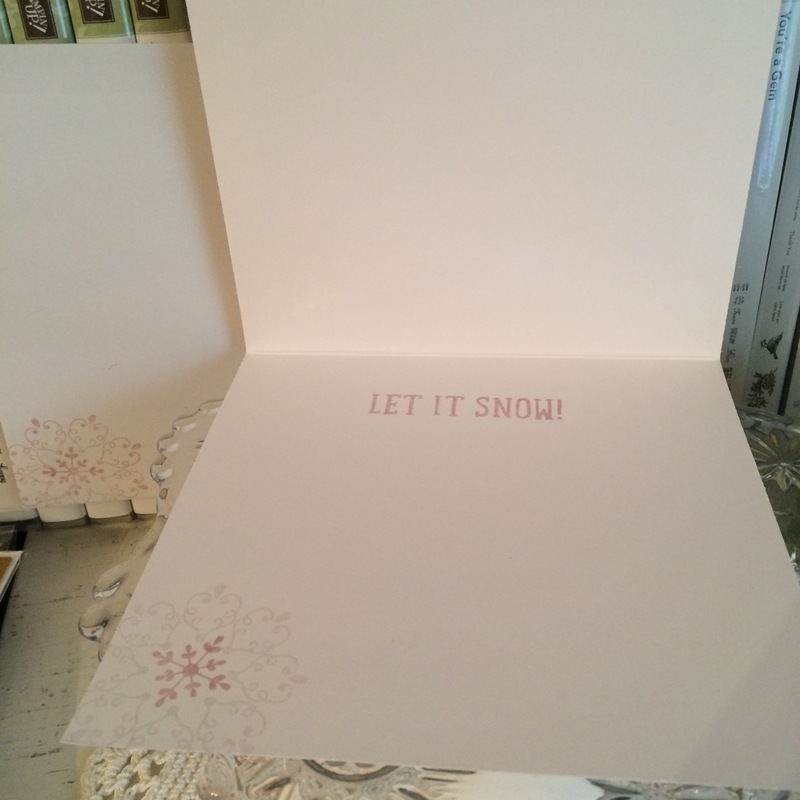 My friend E assured me that I could indeed use Distress inks for embossing. So I got out my catch-all tray and my coffee filter and proceeded to pour the Iridescent Ice powder overtop (hoping I was making the right decision and not ruining a lovely piece of paper) and then heat embossed it, as the label suggested, three times before I finally saw the powder changing and understood what it was going to look like or do. Turns out I love this look. It reminds me of our Dazzling Diamonds Glimmer Paper except it’s not as thick and has slightly different colors. I’ll have to try this technique again sometime. I also appreciate how the pink and green sponged inks are still coming through the translucentness of the embossing powder. It’s faint, but it works. With the lace oval paper finished, I turned my attention to the bride stamp. I chose Archival Basic Gray ink because it felt like black would be too harsh and bold against the soft oval. I had to stamp the bride several times with my stamp platform because it was the first time I’d used the stamp and I hadn’t prepared it even though I know better. So my outline got a little thicker than I’d intended. After she was stamped, I watercolored the bride’s hair, skin, bow, and flowers with watercolor pencils and used an AquaPainter on those places afterward. For the dress, I decided to experiment with some Nuvo Crystal Drops (Ivory Seashell color) new to my stash. Since that is also translucent, I was hoping it would soften the lines of the dress if I covered them with the liquid. I later went back over the dress again, using a paintbrush to smooth out the Drops on the paper. I also took Wink of Stella to the bride’s bouquet (though I erred first and grabbed my White instead of my Clear. Once it dried, I realized what I had done and went back over the bouquet with Clear as well.) It sparkles more in person than in the photo. So I had one finished oval and one watercolored, Nuvoed bride. I wasn’t sure how to treat the background behind her. In my mind I had seen her on white, but that seemed far too plain now. I thought of putting a watercolor pencil down as a background but couldn’t settle on which color. Blue for sky? (So she’s out in the open, looking at nothing?) Or some kind of background stamp to imitate wallpaper or wood planks? I then decided to think about the Graceful Glass vellum and hit upon an idea I’ll use at a later date, before the vellum led me to looking through my current DSP. I ended up fussy-cutting around her and placing her on patterned paper so I wouldn’t have to mask her for a background stamp or risk ruining something. Something then made me think about the Rose Metallic Thread I had stored with my baker’s twine, and I decided to do a bow of some sort. I’m not very good at bows with delicate threads yet. I ended up laying ATG tape on the back of the sentiment and looping it around and sticking to the tape however it looked the best to me. The gold-and-white “Best Wishes” sentiment came from a resist coloring pack from another maker. I just left it as is, since I had enough color going on already. It fit with the “brown” tones of the card anyway. The gold on the sentiment appears to have been embossed, though it came that way in the pack and I merely cut it out. I popped up the sentiment with its new metallic loops with Stampin’ Dimensionals foam dots, placing it right above the hollow circles at the bottom of the oval. The last touch on the front of the card was the tiny little mini pearls I used on the buttons of her bridal dress. I had SU’s white mini pearls from the Notes of Kindness card kit on her dress originally but later changed to even smaller ones from Recollections. If I had set out to create this exact card, even with all the detail, it wouldn’t have taken me very long. But creating from scratch and using trial-and-error means that sometimes happy accidents have to happen to lead the creator to the next step, which later seems so obvious. 🙂 I’m really quite happy with this card now, but there were moments when I wondered where I was going with it. Maybe you’ll find even faster ways to recreate this card. I’d love to see what you come up with! I think this card could be used for a bridal shower, a wedding card for the couple, or an anniversary card. It just depends on which sentiments we use. Thanks for stopping by my blog! To continue with the hop, see what Karen Finkle created by clicking on the Next button or visiting her link below. 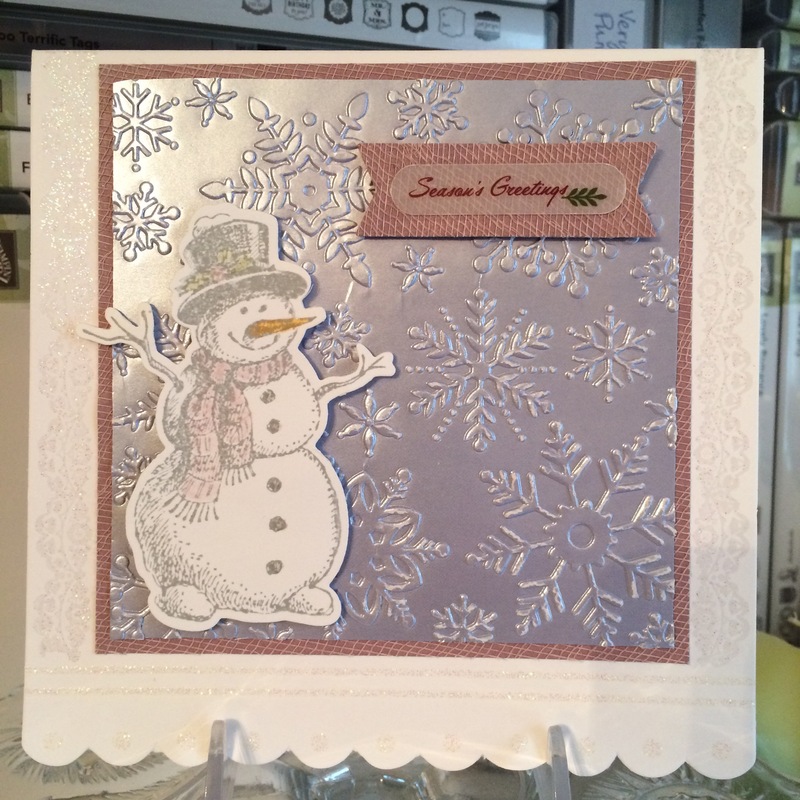 To go back to see Sue Prather’s card, click Previous or her link above mine. See you next time! Connie Troyer: You are here!